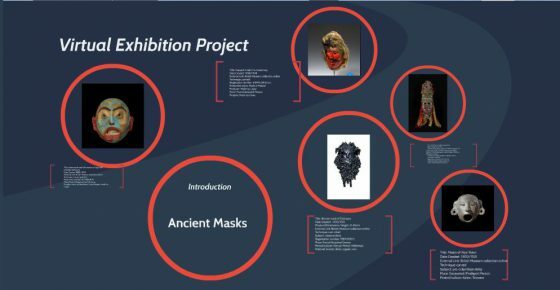 In a previous article on Art History Teaching Resources, I outlined my experiences using Google Arts Project (GAP) in my online art history classes to create virtual exhibitions. At the time, GAP was the only online program that offered its users the ability to create their own exhibition complete with text and image without having to download plug-ins or software onto their own computers. For this reason, I continued to use GAP for my Virtual Exhibition Project (VEP) assignment even though the web program was clunky and difficult to master. My article was shared widely within and without the discipline and I received messages from colleagues all over the country with helpful ideas and commiseration. Although I don’t credit/fault myself, or the popularity of AHTR for the (seemingly) sudden disappearance of GAP’s online exhibition function only a few months later, I can’t help but wonder if other instructors sent their own comments to GAP, as well. Mid-semester (which I know has no bearing in the world beyond academia), GAP overhauled their website, leaving me floundering for a back-up program with which to have my students create their virtual exhibition projects. At the time, I was teaching both Art History foundational surveys and American Art, all of which I had created with the VEP using GAP as the capstone assignment. My first course of action, as always, was to post a query on AHTR’s Facebook page. I scoured the internet for comparable programs, but most (such as Omeka and ArtSteps) relied too heavily on design skills that my students would have to learn in addition to using an unknown program for a unique assignment in a new academic subject – too many unfamiliar variables. I had to make a choice quickly, so I went with Prezi, a presentation software that emphasizes spatial relationships among objects and ideas. 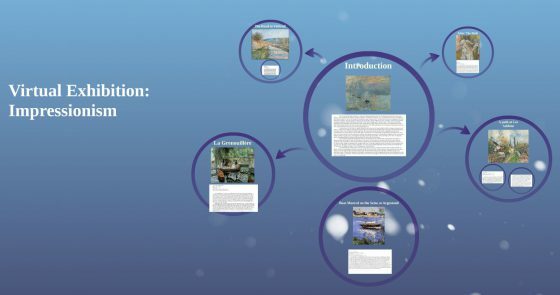 I re-designed the project so that students could still take advantage of the plethora of high-quality images in the Google Arts Project database while using Prezi as a method of delivery. My hope was that students would easily navigate the two programs and develop interesting presentations that would take the place of the virtual exhibition. While many students did just that, others had difficulty navigating between GAP, Prezi, and Blackboard – too many programs. Those who could not figure out how to use Prezi ended up creating their projects in PowerPoint, a safe and easy alternative. 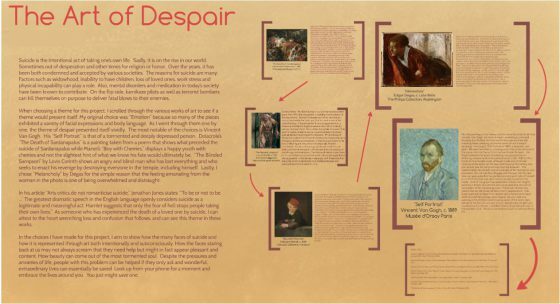 After settling on a theme, students would write an introduction that explained their theme, situated the artworks in their cultural context, and demonstrated an understanding of the importance of the artworks in a broader historical context. For each work of art, students were to write short summaries that demonstrated their knowledge of the art object, the culture in which it was produced, and its relationship to the exhibition theme. As it turned out, the assignment as a whole worked well, but I found that the most problematic issue in each class was with apparent lack of structure in choosing works of art. One of the main issues with an open-ended image choice assignment is that students at the foundational level generally do not have a clear understanding of what constitutes art – or periodization, or cultural divisions, etc… in art. For Survey I, I had students choosing everything from cave paintings to Jackson Pollock and from Thomas Kinkade to various unknown people who make art and put it on their own websites. In the Survey II, one student likened Claude Lorrain to Bob Ross, because, “Just like Ross painted ‘happy little trees,’ Lorrain paints perfect little tress that show nature at its highest potential.” I quickly realized that students need more guidance than telling them to choose a work of art from that fits within the timeframe and scope of the course. For the next semester, I chose existing virtual exhibitions from GAP and asked my students to choose works of art from those exhibitions. GAP has a plethora of well-designed virtual exhibitions such as Norman Rockwell in the age of the Civil Rights Movement, Ancient Masks from the British Museum, and Heaven, Hell, and Dying Well in the Middle Ages. In this iteration, the assignment proved to be easier for the students and for me in terms of time spent on clarifying emails and course announcements. However, the entire project, in my opinion, had become more of a nuisance than necessary and I recently decided to scrap the assignment altogether for Spring 2017. I hope that this post will generate a collegial dialogue in search of a more user-friendly solution – suggestions are welcomed! In the meantime, I will focus more on my Case Study assignments, which students claim they enjoy more anyway. In a subsequent post, I will write about my experiences with these assignments which enable the student to integrate history with their present lives. I’m planning to use Scalar for an online exhibit project for my spring courses. I’ve used it for personal scholarship and found it pretty intuitive and user friendly. Fingers crossed for using it with students…! We have been working with the Google Cultural Institute a lot at moMA, Jennifer, and I wonder if there is a way we could ask them to write a response post or to engage the discussion you have started here–let’s discuss, if you’re interested, and we could find out? I’m also disappointed about the disappearance of the “create your own gallery” feature of GAP. I used it regularly, immediately upon my discovery of the feature, and had a large number of gallery collections assembled around different lessons. I likewise used it for students to build their own collections. I submitted a query, but no response. I think an easier interface than Prezi, is VoiceThread. It allows for asynchronous interaction among students and takes the presentation beyond the classroom, either before or after a formal in-class presentation. I found it much easier for students to learn than Prezi and much more image-centered. It also allowed for less vocal contributors to chime in, as they can edit their own remarks, honing the structure of their arguments.